Stephen Fry and the panelists on the BBC show QI are struck by the strange motions of the inverted face of Albert Einstein demonstrating the Hollow Face Illusion, and a little side-variation of the illusion. We've told you about the Hollow Face Illusion before. This illusion involves a sculpted face, but instead of the usual convex human face of a sculpture, the sculpture is flipped and we're shown the inside of the face. 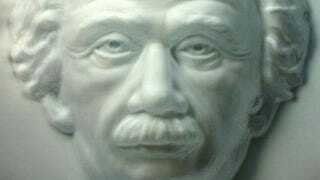 In this case, it looks like Einstein stuck his face in some molten plastic and we're looking at the impression. But we don't think we are. As you can see, the video shows an inverted face, and we see a regular face. No matter how many times the face goes around, and how much we 'know' that we're looking at an inversion, the face 'pops out' when it moves far enough. Unlike many optical illusions, which dissolve when we know the trick, this one stands strong. The part of the brain that recognizes faces kicks into gear and matches the features. Because it's an inversion, the outermost features don't block the features behind them. (Usually, when we walk to the left of a person, the nose blocks out a bit of cheekbone, and lets us see how the face turns in relation to our point of view. In this case the nose can't block out anything. It's inverted. We still see the whole face, which makes the face look like it's turning.) What we usually don't see with other Hollow Face Illusions is Hollow Face in rotation. Look at the face when it's inverted. It looks like the face is turning to the left. It's only when the back side is visible that we can really see that the object itself is turning to the right. The Hollow Face Illusion makes the object appear to be turning the opposite direction that it actually is. Via The BBC's Youtube Channel.